We finally know when the secret project Donald Glover and Rihanna have been working on is coming out, after months of speculation. British actor Letitia Wright also stars. 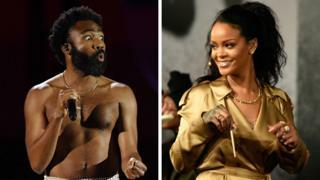 The first we heard about Guava Island was last August when a picture surfaced of Rihanna and Donald Glover working together in Cuba. Then, at a secret festival Donald Glover threw in New Zealand, we saw the pair together on screen for the first time - with Rihanna seemingly Donald's love interest. The film is reportedly an hour long and centres around a musician who wants to put on a festival everyone on the island can enjoy. Presumably, it's not going to be a simple task. Guava Island's inspiration is said to be the Brazilian crime drama City of God, and Purple Rain, a 1984 rock musical drama based on and starring Prince. And with Donald Glover well-known for creating surreal pieces of TV, who knows what we should expect from Guava Island. Guava Island is directed by Hiro Murai, the director behind most of Atlanta's episodes, and written by Donald's brother Stephen. Those two partnered frequently over the two seasons of Atlanta, and produced episodes that tackled serious issues as well ones that were more light-hearted. Letitia Wright, best-known for her role as Shuri in Black Panther - and another Brit, Nonso Anozie - star alongside Rihanna and Donald Glover. We don't know anything about their characters so far. What we do know is that over the past few years, with his work on Atlanta and the critically-acclaimed music video for This Is America, Donald Glover has built up quite a reputation. Amazon Studios boss Jennifer Salke told Vanity Fair she would've put money down for a Donald Glover film without having seen it. "I knew whatever he wanted to amplify would have relevance and be entertaining. He has that ability to create cultural moments and spread a message that's interesting," she said. This has been a hugely secretive project and that is how Donald Glover likes to work - he's always said it gives him more "creative freedom". A picture of Glover and Rihanna from set leaked but only added to the mystery - is it a film? A new collaborative album? Or are they just hanging out in Cuba? Donald Glover has proved he can create important cultural moments without the need for promotion - take This Is America as the perfect example. But the fact his film is being streamed immediately after his headline set at Coachella is a genius move, the perfect encore. The fact it's free for the first 18 hours - when so many people will be talking about his set - is a good move by Amazon. They could see a big increase in subscribers.